GrillGrates act as a flame shield allowing for more direct grilling at higher temps without burning. 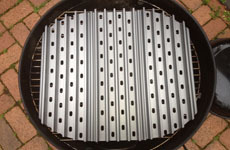 Cut to shape GrillGrates interlock and lay on top of the existing grid. You can also use rectangular GrillGrates and essentially square off the circle. Stop constantly moving food away from hot spots and flare-ups. Grill more directly with added protection. Use more grill surface instead of ½ of it. Juices sizzle in the valleys for added flavor and moisture- not fuel for the flames. Cut to shape GrillGrates lay on top of round and oval grills. 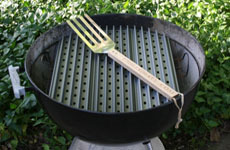 Packaged in sets with the GrateTool, all GrillGrates are 5.25" wide and interlock to create a uniform surface. Set of Two 13.75 inch GrillGrates radius cut to fit 14.5" diameter grills such as the Smokey Joe and all 14.5" diameter grills. Set of Three 13.75" GrillGrates radius cut to fit 18.5" diameter grills such as the Weber kettle, Jumbo Joe all 18.5" diameter grills. Set of Three 20" GrillGrates radius cut to fit the 22.5" Weber Kettle and all 22.5" diameter grills. This is the set up the champs use! 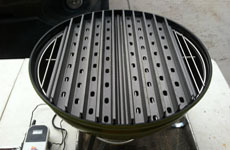 Set of Four 20" GrillGrates radius cut to fit the 24" Weber Summit Charcoal and all 24-26" diameter grills.